The blockchain technology has managed to make an immense impact all over the Internet since its creation in 2008. Lots of companies all over the world are working towards incorporating blockchain into their business. 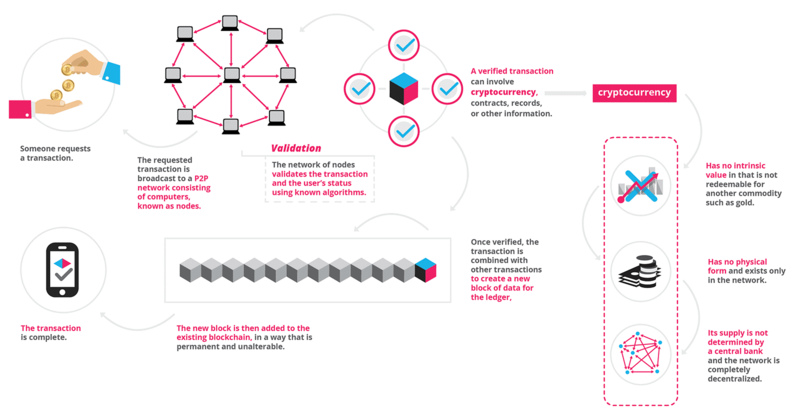 But what exactly IS blockchain and how does it differ from everything we have seen before? Invented in 2008 by an individual or a group of individuals known by the pseudonym Satoshi Nakamoto, blockchain was initially dedicated Bitcoin cryptocurrency. Since then, the technology has seen numerous applications in other fields as well. Firstly, it is important to mention that blockchain is, basically, a publicly available worldwide database. Not only it allows anyone in the world to add information to it, it also makes this information incorruptible by spreading it all over the network. The data is not stored in any particular place or on a server, it is distributed all over which makes it unalterable and more secure than in the confines of any technology existing before blockchain. Additionally, it’s an open source software, so you can even create your own blockchain. The system is decentralized and cannot be controlled by any single party in the world. Also, editing of the already submitted data is, if not impossible, at least extremely unlikely to happen. This is achieved due to the fact that in order to customize any information, an enormously powerful computing power is required, and if Bitcoin is compromised it will lose its value. So, what does the blockchain do for us and how can one benefit from it? For a common user, the use of blockchain in most of the areas of life doesn’t make much difference. However, there is an area where this technology gained the most popularity. That is cryptocurrencies exchange market. Following the Bitcoin’s invention alongside with blockchain’s in 2008, other cryptocurrencies started to develop all around the world. At the moment, there are about 700 digital currencies existing all over the net, though not all of them are super popular. A lot of people started thinking how to start a bitcoin business or something similar (since in some countries Bitcoin is illegal). To deal with such a huge number of currencies the exchange resources started to appear. While there are dozens of the exchanges already available on the market, they differ by the number of currencies they allow to trade, their commissions, limitations, etc. One of the biggest recent booms on the cryptocurrency exchange market was Binance. Binance is an initially Chinese-based company which was launched in summer 2017 by a group of highly experienced specialists. It is now led by its CEO Changpeng Zhao. Mr. Zhao had previously worked with Bloomberg, as well as with Blockchain.info in the technological department and, thus, was able to create a very strong team for the product development. The company has pitched the ICO and their own token launch to kick things off with the cryptocurrency trading software. Initially providing information via the whitepaper, they managed to reach their fundraising goal by mid-September, just in time before China has issued a ban on the token fundraising. Millions of dollars were raised from venture capitalists (VC) in the financing round. The launched Binance Coin (BNB) was announced to be issued with a limit of 200MM and to feature a possibility to be used later on within the company for internal service purchases. Binance has also stated that they will eventually be buying half of the issued tokens back and destroying them. At the moment, the ICO has almost finished its course demonstrating an impressive number of more than 40,000 token holders. How did it take off? Binance is quite a new player on the digital exchange market but it is already valued at around $2 billion. Impressive, right? What was it about them that attracted so many people to start working with them? In the first place, a clear and transparent idea generated by an extremely skilled team with an experience in exchange trading. Secondly, the big number of Initial Coin Listings, as well as very low trading fees compared to other companies in the industry. A user is only charged 0.01% off every trade made and small fees are charged for currency withdrawals as well. 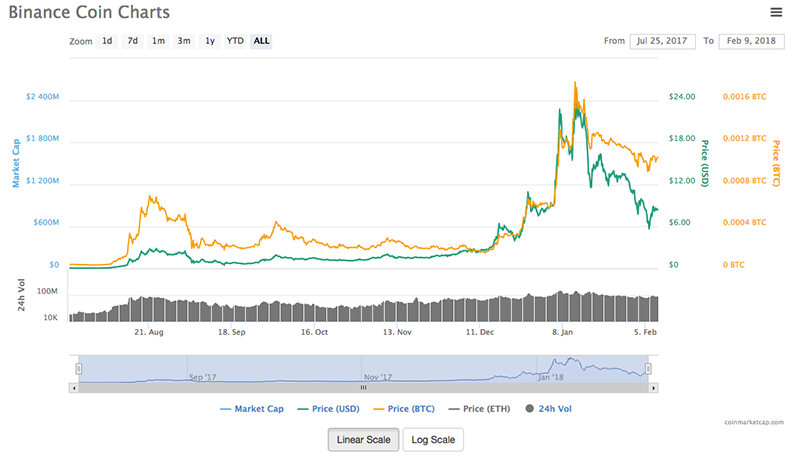 In less than 6 months, Binance had managed to become a highly profitable company with almost 3 million users globally and around 100 digital currencies in trade. The value of BNB has been steadily rising due to the number of trades made on the platform. But this is not all that makes Binance different from other exchange companies. Besides doing currency exchange, Binance has also created some truly unique services like “Gifto” for virtual gifting and a “LaunchPad” token sale program. They also provide support and guidance for new startups, which includes but not limited by listing and even cryptocurrency funding. Why creating an exchange application makes sense? Cryptocurrency exchange market has proven itself to be highly profitable if approached correctly. The number of exchange platforms increased but the quality of some resources’ services can still be a question. Given that cryptocurrency exchange rates are not governed, they have boosted to unthinkably high levels with, however, no guarantees of them staying there. But the more the market develops, the more trust it gains from users, and the more benefits it brings to those who know how to work with it. That is why creating a high-quality cryptocurrency trading app is an amazing idea. So, let’s see what do you need to pay attention to and how to start a cryptocurrency exchange service via the app. The signup or login page is the first thing a user will see, but the main point of it is not just to let people in after registration but to also protect the system from any unauthorized logins, hack attacks, or any other kind of manipulations. For this reason, this functionality should be very well developed and correspond to the highest standards. Besides the general login/password combination, there is also a 2FA to provide additional security for users. One of the reasons the crypto exchange market is so trusted among the users is that every user is thoroughly verified. Depending on the type of verification, the verified users generally have more possibilities. For example, the limits for withdrawal for the verified users are higher than for the non-verified. The verification is important to ensure the transparency of trades and to minimize the possibility of a scam. This feature allows traders to deposit money into the internal wallet featured by the cryptocurrency exchange software, as well as to withdraw money to the wallets outside of the software according to the limits set by the company. Every user should have a possibility to buy or sell currency to other users in the system. It’s very important that all the trades are happening fast and without any system errors. The system should have several possibilities for orders creation in order to allow the user to choose the one which is convenient for them at the moment. A very useful feature which allows creating various graphs and stats for better visibility. The exchange’s own API is required to allow users to create their own automated trading systems or the data exchange among the verified devices using the cryptocurrency exchange script. With the help of the admin panel, the employees of the exchange company will be able to monitor trades and to manage the actions made on the exchange based on their access level. These are only the main features required by any application of such type. There is much more to be implemented in the app to make it not only usable but also secure and user-friendly. It’s no secret that, lately, most of the applications’ development process is divided into the aspects which are handled separately. Various aspects are generally developed by different teams in collaboration with each other. Such moments can include an API, web interface, etc. The number and variations of them depend on the complexity of the application. This is the first thing for the client to see before starting to use the application. In order to develop a harmonic design combining both beauty and usability, we follow the trending best practices and take into account the wishes of our customers. The design creation includes the following stages. 1. Wireframes – the base of the future design where its key features are implemented. 2. Prototype – the detailed visualization of the user’s interaction with the application that allows to prevent the possible UX-related issues. The part which is responsible for the actual processing and storing of data concerning trades between users in a secure environment (any alteration by any party is impossible thanks to the blockchain). An obligatory part of the modern application development. It is extremely important as it allows distinguishing and eliminating most of the bugs within the logic, as well as within the UI before actually launching the application. Secure architecture – while developing the backend part of the application, we paid attention to creating the secure way of storing and exchanging the confidential information. User’s authentication – in order to prevent the possibility of unauthorized login to the user account, we implemented two-factor authentication by generating a one-time token. Additionally, the users receive the notifications about logins to their account specifying the location and the IP-address. Considering the popularity of the crypto exchange all over the world right now, it is understandable why more and more people are involving themselves in these systems. Digital currency exchange provides great opportunities for both those who are just getting familiar with the market and those who already have quite a good experience in it. But the market still has quite a few limitations depending on the country or the currency provided and this always means growth potential. Creating a high-quality application for your own cryptocurrency exchange company can bring you a great profit in very short terms. The table below provides approximate pricing for an application development. If you are interested in creating an application of the discussed type, Sloboda Studio will be happy to help you build a prominent cryptocurrency exchange software. Our Team of highly-qualified developers can assist you with any questions related to the development and make sure that you get your very own unique application. Thanks for the article. Can you approximately tell the job volume in labor hours.